During the build of UFC 229 former two-division Champion, Conor Mcgregor and current lightweight champion Khabib Nurmagomedov fired shots on each other on social media, had heated press conference, attacks on family and religion. Last night Khabib settled the business after submitting McGregor via neck crank in the fourth round to retain the title. Literally seconds after the Khabib wins, he leaped over the fence and started a brawl with Mcgregor’s teammate and coach Dillon Danis. Khabib’s teammate jumped inside the Octagon and sucker punched dazed Mcgregor. Police escorted out both camps multiple teammates from the venue with security. Also both fighters Mcgregor and Khabib were escorted out of the Octagon to backstage, then later UFC announcer Bruce Buffer announced: Russian as the winner. 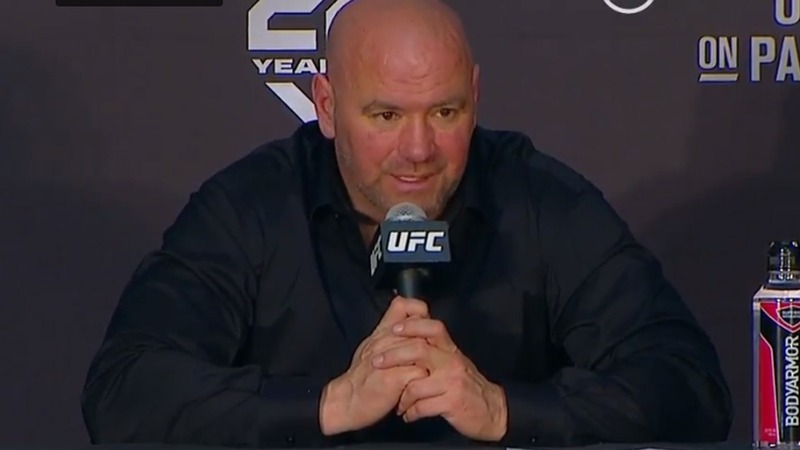 Dana White didn’t put the belt on Khabib after the big win. White explained why he didn’t put the belt on Khabib. White feared that fans threw trash and other stuff at him as he leaves the arena. White didn’t expect the Khabib vs. McGregor bad blood to end after UFC 229 showdown; head honcho said he’s eventually surprised by after fight brawl. White also said Mcgregor is ok just upset over how the fight went, not what happened after the match was over. White said Khabib’s three teammates have been arrested and there could be a possibility that Eagle and his camp may not get the visa in future. Dana White said police released the Khabib teammates as Mcgregor refuse to do press charges against them. Also said the guy who jumped inside the Octagon and attacked Mcgregor will never fight in UFC again.